When residents in Buffalo, NY need a reliable electrical contractor they can trust, they call Ries Electrical. We are the name residential and commercial customers know and trust to successfully complete electrical jobs for homes and businesses throughout Western New York. Ries Electrical is a fully licensed and insured electric company with more than 37 years of experience to put to work for you. Not only that, but we are also proud to maintain an “A+” rating with the Better Business Bureau for our hard work, dedication, and honorable service. We are a full service electrical contractor that specializes in commercial and residential electrical repair, design, upgrades, installation, and more. Whether you’re building a new home from the ground up and need a professional to install the wiring, or you need circuit breakers repaired throughout your office, we are the team to enlist for the job. Customers continue to rely on our knowledge and professionalism. We work smartly and carefully, as we know that working with electricity can be dangerous. It’s best to leave the job of installing the wiring for your swimming pool or diagnosing issues with your office’s outlets to the experts. We’re Buffalo’s leading electrical company for energy efficient electrical repair, electrical construction, and much more for many good reasons. We’re prompt, we keep our services affordable and prices competitive, and we are committed to fixing your electrical problems for good. 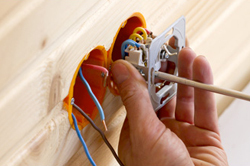 Whether you’re remodeling your kitchen, relocating your office, or need basic repairs, turn to Ries Electrical. Call for a free estimate on your project!